When experiencing issues connecting to WiFi or receiving an “Authentication Problem” error message on your IDVisor Smart or Smart Plus. Please try the following troubleshooting steps below. 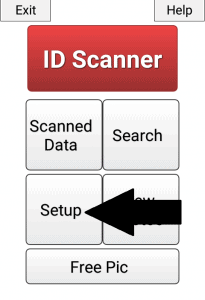 Note: Before beginning any troubleshooting steps please try to log on to idscanner.us on another device you own. Please be sure the device is connected to the current WiFi network you are trying to access. 1) Make sure you are in range of your WiFi router. If you are not in range of your WiFi router this will affect the connectivity because the signal will be too low. 2) After assuring the WiFi router is in range and the device is still facing connectivity issues. 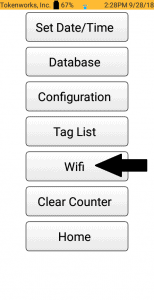 Follow the steps below to disconnect and reconnect your WiFi network. Find the WiFi network you are trying to connect to. You will see Authentication problem under the network that is having trouble connecting. Hold down the network you are trying to connect to for 5 seconds then let go. You should see the options appear as in the picture to the right. You will then select Forget. 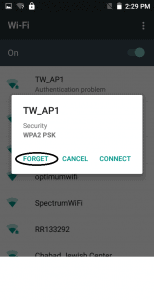 Once the network has been forgotten, reconnect it by selecting the network once more and entering the Password. If after entering the password the Authentication problem still occurs, please forget and reconnect the network again ensuring the password is entered correctly. 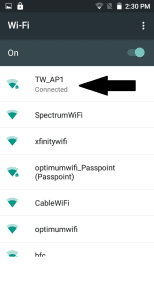 After successfully connecting to your network, you should Connected under the WiFi network. 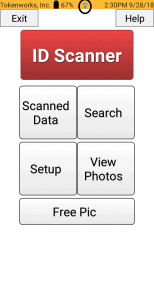 After successfully connecting to your WiFi network, please press the Back icon button to the left of the scan button on your device until you are back on the home screen. You should now the see WiFi symbol showing you are connected. 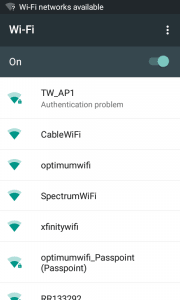 If after attempting these troubleshooting steps you are still unable to connect to WiFi on your device please create a support ticket leaving your Name, Business name, Phone, and email address here.